This image released April 8, 2018, by the Syrian Civil Defense White Helmets, shows a child receiving oxygen through respirators following an alleged poison gas attack in the rebel-held town of Douma, near Damascus, Syria. Russia and the United States veered dangerously toward a military conflict on Monday, trading threats and warnings after an alleged chemical weapons attack carried out by the Russian-allied regime in Syria. Moscow and Washington – already locked in a sanctions war over the conflict in Ukraine and allegations of Russian meddling in the U.S. presidential election – disagree vehemently about what happened on Saturday in Douma, a rebel-held town on the outskirts of Damascus. They also diverge about what should come next. 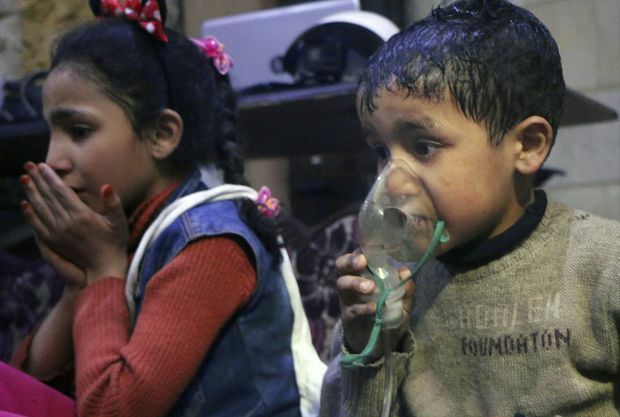 The United States – pointing to dozens of heartbreaking videos of dead and dying children, some with foam around their mouths – alleges that forces loyal to Mr. al-Assad deployed chemical weapons, yet again, in a Saturday attack that killed at least 42 people. Mr. Trump said on Monday that he would make “major decisions” about how to respond by the end of Monday, or sometime on Tuesday. He hinted that Mr. al-Assad’s backers in Russia and Iran could also be held to account. Abandoning his previous admiration for Russian President Vladimir Putin, Mr. Trump said the Russian leader would “pay a price” if he were found to be responsible for the attack on Douma. “He will, everybody will,” Mr. Trump said, without offering specifics. Expectations are now high that Mr. Trump − who just days earlier said he wanted to withdraw all U.S. troops from Syria − will seek to punish the Syrian military through some kind of military strike, perhaps akin to the cruise missile barrage he ordered after a chemical attack on Khan Sheikhoun almost a year ago to the day. The geopolitical situation has grown more complicated since then. Where last year’s U.S. strike drew only complaints from Damascus, Moscow and Tehran, Russia has signalled that it would not stand by and watch another attack on its ally. Russia disputes that a chemical weapons attack took place in Douma, claiming Mr. Assad’s opponents manufactured the videos circulating online. Vassily Nebenzia, Russia’s ambassador to the United Nations, told an emergency session of the UN Security Council that even if there had been an attack, it could have been a false-flag operation aimed at framing Mr. al-Assad and his allies. The United States submitted a draft resolution to the Security Council condemning the use of chemical weapons in Syria and establishing a panel to investigate the alleged attacks. Russia was expected to veto the resolution when it comes to a vote on Tuesday, as it has 11 previous resolutions that were critical of the Assad regime. Russia has thousands of troops in Syria, including formidable air force and air defence units that have helped turn the tide of the country’s seven-year-old civil war in Mr. al-Assad’s favour. With tensions rising in Europe as well, Russia’s military began snap combat-readiness drills on Monday involving units based on its own soil. Mr. Nebenzia said Russia and Syria were ready to guarantee the safety of inspectors from the Organization for the Prohibition of Chemical Weapons if they wanted to visit the site of the alleged attack. It was unclear on Monday whether that would happen. Nikki Haley, the U.S. ambassador to the UN, warned that the world is on the edge of a “dangerous precipice” and could not allow the use of chemical weapons to become normal. She said the United States would take action in Syria regardless of what the UN Security Council decides. The growing risk of a U.S.-Russia clash is just one of the moving parts in Syria’s deadly war, which began in 2011 and has left upward of 400,000 people dead and driven millions more from their homes. Israeli jets are reported to have struck a Syrian airfield used by Iran on Sunday, killing 14 people. Israel’s Prime Minister Benjamin Netanyahu and Iran’s Supreme Leader Ali Khamenei both now refer to Syria as the “front line” in the prolonged, and until recently indirect, conflict between their two states. The Turkish army is also deeply involved in northern Syria, where President Recep Tayyip Erdogan ordered an invasion intended to drive out Kurdish forces that he considers “terrorists,” but which the United States values as key allies in the not-quite-finished battle against the Islamic State. France is another key player, vowing to act against Mr. al-Assad’s forces – if they are shown to have been behind the Douma attack – and, separately, to support the Kurds. The dominoes began to fall this weekend with the collapse of a ceasefire deal under which the Islamist Army of Islam militia were to surrender Douma to pro-Assad forces. The Army of Islam remnants decided instead to stay and fight. If the Assad regime did use chemical weapons on Douma, the likely motive was to force the Army of Islam fighters to leave. In that respect, the alleged attack could be considered successful: Army of Islam surrendered Douma on Sunday morning, just hours after the first video evidence of the chemical attack began to emerge. But what may be a small tactical gain for Mr. al-Assad’s forces has clouded the future for Syria, the region and far beyond.